University College Dublin (UCD) (Irish: An Coláiste Ollscoile, Baile Átha Cliath) - formally known as University College Dublin - National University of Ireland, Dublin (Irish: An Coláiste Ollscoile, Baile Átha Cliath - Ollscoil na hÉireann, Baile Átha Cliath) is Ireland's largest university, with over 1,300 faculty and 22,000 students. 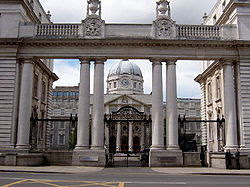 It is located in Dublin, capital of Ireland. 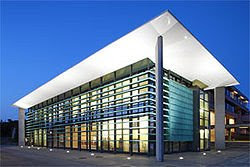 University College Dublin (UCD) is a dynamic, modern university where cutting-edge research and scholarship provide a stimulating intellectual environment - the ideal surroundings for learning and discovery. For over 150 years, UCD has produced graduates of remarkable distinction including famous surgeons, architects, entrepreneurs and five of Ireland’s Taoisigh (Prime Ministers). Perhaps the best known of all its graduates is the writer James Joyce, who completed his Bachelor of Arts at the university in 1902. Established in 1854, the university played a key role in the history of the modern Irish State and today it plays a leading part in shaping Ireland’s future. As Ireland forges a new identity through relationships with international partners, the university will adopt an increasingly international outlook. 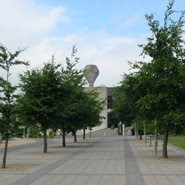 To accommodate the university’s phenomenal growth during the 1960s and 1970s, UCD relocated from St Stephen's Green in Dublin city centre, where it was first established, to the Belfield campus 4 km from the city centre. 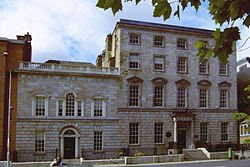 The university still maintains Newman House on St Stephen’s Green in Dublin, one of its original buildings and there is also a campus facility at Blackrock, Dublin, where the UCD Michael Smurfit Graduate School of Business is located. UCD has recently published a campus development plan to chart the physical evolution of the Belfield campus for the next decade. This plan includes a vision for world class architecture, a more than ten-fold increase in the boundary woodland and the network of pedestrian walkways, and a transformation of the academic infrastructure to reflect the ambitions of a leading European university. More than 25% of the current student population is engaged in graduate research and scholarship. Each of the five colleges at the university has its own dedicated graduate school with the explicit task of enhancing doctoral and post-doctoral training to match the national strategy of establishing Ireland as a premier source of 4th level education and research. UCD has extensive facilities to support teaching and learning including well-resourced libraries and computing facilities. As the university rapidly moves forward in the e-learning arena, an increasing number of resources to support learning and research are electronically available, both on- and off-campus. Student health, welfare and counselling services are second-to none and there are also superb opportunities for sports and recreation.